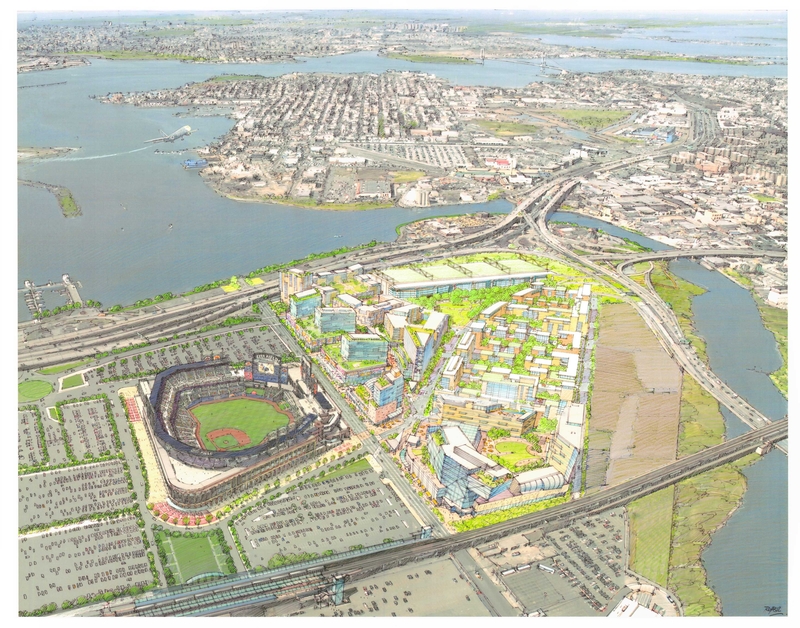 Willets Point, as envisioned by EDC. Image: EDC. Eminent domain supported if negotiations with local businesses fail. On September 24, 2008, the City Planning Commission approved a modified version of the Willets Point Redevelopment Plan, and sent the contentious plan to the City Council. EDC’s plan calls for the creation of the Special Willets Point District, an Urban Renewal Area designation, and a rezoning for the 61-acre area known as the “Iron Triangle” in Queens. 5 CityLand 57 (May 15, 2008). The plan has drawn criticism from local businesses and elected officials, and has led to the filing of at least one lawsuit against the City. At the June 13, 2007 City Council Land Use Committee and Economic Development Committee joint oversight hearing on EDC’s proposal, Land Use Chair Melinda Katz criticized EDC’s decision to begin the land use process before selecting a developer, while other Council Members questioned EDC’s plan to develop the entire site as opposed to a more stepped approach that would allow existing businesses to remain in the area. 4 CityLand 87 (July 15, 2007). Shortly before the Planning Commission’s August 13, 2008 public hearing related to the zoning amendment, 32 of the Council’s 51 members sent a letter to the Commission stating that the Council Members would not approve the plan unless the community’s concerns regarding eminent domain, developer selection, business relocation, local resident/worker set-asides, and affordable housing were addressed. Council Member Hiram Monserrate, whose district includes Willets Point, drafted the letter, and 15 of the 25 members on the Council’s Land Use Committee signed in support. At the Planning Commission’s public hearing, members of the Willets Point Industry and Realty Association spoke out against the plan. The Association supports owner development of Willets Point, opposes eminent domain, and has accused the City of neglect since Willets Point lacks sanitary sewers and paved streets despite a 1991 NYC Public Development Corporation study that recommended installation of the same. The Association also disagrees with EDC’s decision to navigate through the ULURP process without first selecting a developer or a final development plan. The Commission modified EDC’s plan in several ways, but expressed its overall support for the plan, including the special district, urban renewal plan, and rezoning. Modifications include prohibiting enclosed sidewalk cafes in the special district, limiting accessory illuminated and flashing business signs to 126th Street, and mandating 15ft. street-widths on wide streets and 13ft. street-widths on all other streets. The Commission stated that it was imperative for the entire site to be developed as a whole, and that if negotiations with local businesses failed, eminent domain would be an appropriate method of assembling the property for disposition as outlined in the urban renewal plan. The Commission approved the modified plan, with only Commissioner Karen A. Phillips voting no. Lead Agency: Office,Deputy Mayor for Eco.